The Tufts administration’s hiring of non-union workers and companies for university construction projects has been challenged by protest efforts since this summer in the form of flyers, signs and, in the past two weeks, mobile billboard trucks on campus. These actions have been organized by the Boston Building Trades Council (Boston BTC), an umbrella organization that works with and represents unionized construction in the Boston area, according to Chelsea Feuchs, the hospital and higher education campaign coordinator for the Boston BTC. The Boston BTC decided to lobby Tufts due to the large number of ongoing construction projects on campus, including the Science and Engineering Complex (SEC), located between Anderson, Robinson and Bromfield-Pearson Halls, that do not utilize fully union-employed labor. “We want Tufts to make a commitment to treating workers well, meaning good pay and benefits alongside safer conditions and better training,” Feuchs said. According to Vice President of Operations Linda Snyder, the administration was willing to compromise with the Boston BTC during their last meeting, but they were uninterested. “We’ve had several meetings, but [they’re] not interested in the things we put on the table,” she said. Boston BTC continuously demanded that all major construction should be done with union only workers in order to ensure that workers receive good wages, benefits and strict safety standards, according to Snyder. However, according to Feuchs, the administration has not provided a plan for minimum worker safety and treatment standards for construction projects at the university. According to Andrew Erickson, president of Guerrilla Mobile Billboards, the mobile billboard trucks that his company provides for interested parties cost around $850 to $900 per eight consecutive hours of driving and parking time, in addition to $1,500 in production costs for the two vinyl banners. Erickson said that labor unions, including Boston BTC and Service Employees International Union (SEIU), frequently use his company’s services. 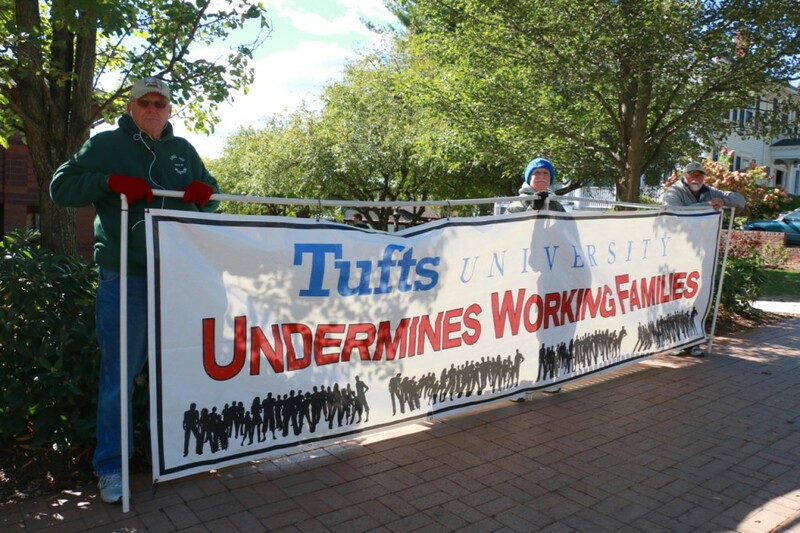 Members of the Boston BTC have also came together at places such as the intersection of Talbot Ave. and College Ave., the intersection of Boston Ave. and College Ave. and outside the Mayer Campus Center, holding signs that read, “Tufts University undermines working families,” among other messages. In an Aug. 5 letter to the Tufts community, Snyder wrote that around 90 percent of those employed for the construction of the SEC building are from union-organized construction trades, and that only the electricians employed for the project are non-union. Construction of the SEC was contracted through Turner Construction Company, a North-American based international construction services company. Turner has also worked on projects such as the construction of the Massachusetts Institute of Technology Brain and Cognitive Sciences Complex and the renovation of Harvard University’s Sherman Fairchild science building, according to the Turner website. The company declined to comment on their ongoing projects at Tufts. According to electrician John Boisclair, who was carrying a banner on College Ave. on Oct. 17, the Boston BTC members were protesting because Tufts was hiring private contractors who employ few union companies. Boisclair said that the company he works for was excluded from the bidding process to do electrical work for the SEC building in spite of the fact that his company offered better prices than the non-union subcontractors who were chosen to do the work. His claim was disputed by Snyder, who said that the subcontractor chosen for the job offered the best value of the six that had been considered. According to Snyder, Tufts saved approximately two million dollars on the $70 million SEC construction project by using a non-union, open-shop electrician subcontractor instead of unionized electricians. In addition, the unionized electrician subcontractors in Turner’s pool had worse safety standards than non-unionized companies, she said. According to Snyder, out of the around 85 construction projects going on across Tufts’ campuses, the “vast bulk of them use union workers.” However, she added that mixed union and non-union labor has been employed due to the nature of contracting work at Tufts and the different projects that have been undertaken recently. “We’ve resisted applying a one-size-fits-all policy to how construction labor is procured on the Medford/Somerville campus,” Snyder said. Snyder explained that the Tufts administration made calculated financial decisions for the construction projects and disagreed with the Boston BTC’s demands for full-union employment. “It’s just wrong to let someone else set rules that increase the cost of education,” she said. According to Snyder, the rebuilding of the Memorial Steps also employs a non-union firm, the construction manager Your Space. The SEC building will total 175,000 square feet and will be a “center of collaborative research, featuring high-end facilities strategically surrounded by the university’s science, math and engineering departments,” according to the Tufts website. It will open at the beginning of the 2017-2018 academic year and will have LEED Platinum energy-efficient certification. Snyder explained that, in Tufts’ multi-step hiring process for construction projects, construction managers recommend a set of subcontractors from which the university selects the companies it wishes to hire. For the electrical work required for the SEC project, three of the six companies Turner recommended employ unionized labor. Snyder said Tufts solely employs contractors with an above-average Experience Modification Rating — the insurance ranking system in place to review the safety practices of various companies. The non-union companies that Tufts employs all boast great safety standards based on this metric, she said. Snyder said that she wanted the university to be more explicit and rigorous about checking subcontractor safety standards. “[We want to be] more explicit about safety standards…[by] specifically asking for rankings for firm safety to make sure that they are better than average,” she said. Snyder said that the SEC project is being undertaken because increasing space for science on campus was one of the highest priorities for University President Anthony Monaco upon his arrival to Tufts. She cited the fact that biology is one of the university’s most popular majors. However, Snyder also added that the university recognizes other construction needs such as those for on-campus housing, with the Board of Trustees increasing funding on deferred maintenance of campus buildings and housing. According to Feuchs, all construction projects on Tufts’ Boston campus use solely unionized workers, a mandate that is often attributed to the strong union culture in Boston. In a 2010 Suffolk University/7 News poll, however, 69 percent of Massachusetts residents opposed hiring only unionized workers for construction projects. “There are more non-union workers in Massachusetts than union workers,” Snyder said. In spite of this claim, Feuchs said that the Boston BTC will continue organizing to lobby Tufts to employ all-union labor. “Our presence will continue until the issue of unfair and unsafe hiring practices are solved,” she said. Correction: The previous version of this story used the acronym MBTC to refer to the Boston Building Trades Council, which should be abbreviated as Boston BTC. The article has been changed to reflect that.